For this recipe I had some pumpkin that I had roasted the day before. Mash up pumpkin so it is soft. Add the rest of the ingredients, except walnuts, and blend for three or four minutes. It’s okay with this muffin recipe to blend well. Line a muffin pan with cupcake holders (it turned out I had run out of these, so I sprayed the pan with olive oil and they did stick a little). Pour by 1/4 cups into the cups. I had a little extra batter so I added a little more to each one. 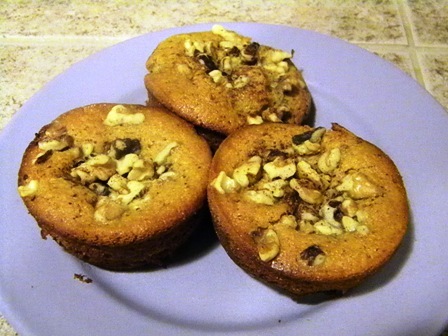 Top each muffin with chopped walnuts. If desired sprinkle a little cinnamon on the top of each. Bake for 18 – 23 minutes, or until knife inserted in the center comes out clean. Is the batter supposed to be dry after all ingredients are mixed together? Our batter is not moist enough to stick together. We are wondering if we are missing a liquid ingredient.